When Kara phoned Thursday, to check in as good friends do, she said, “I know today’s your favorite holiday.” She knows me well. I do love Halloween. I love the crunch of leaves underfoot, the crisp mountain air. I love carving the big pumpkin, planning the costumes, and skipping through the neighborhood at sundown. I love the afternoon light, when it scrapes through the clouds and ignites the last of the changing trees. I love the school parades, the candy (yes, I’ve been known to pilfer Kit Kats and Milky Ways), and the chorus of “trick-or-treat” on a doorstep. I love our neighborhood, with its warm and wonderful people. 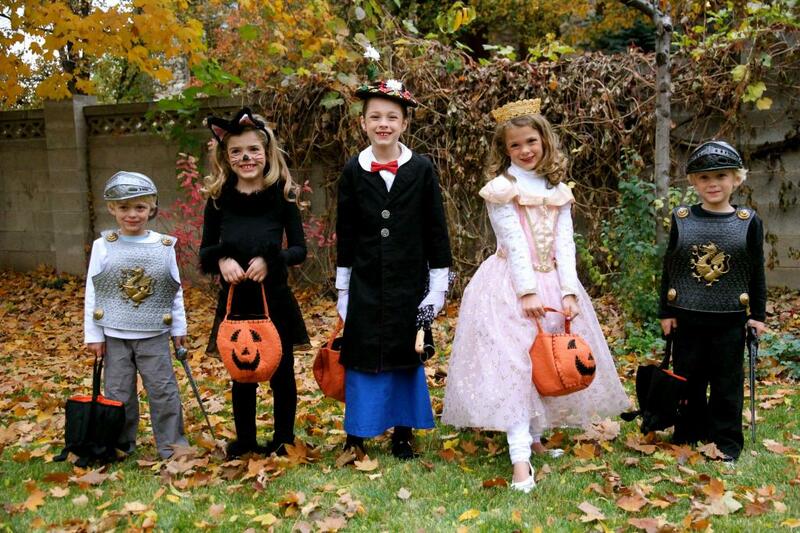 I love the whole fantastic energy of Halloween, of having children this time of year. It is pure delight. And Every year it gets a little easier to help everyone dress and scoot out the door. Mary Poppins had a jolly holiday. This costume goes down as Eliza’s favorite thus far. The hat belonged to my Grandma. I was very close to my Grandma Dorothy, adored her, and each of her granddaughters were given a hat from her collection. My sister Deb inherited this one. So we borrowed it, spruced it up a bit with berries and daisies, and voila! I think Grandma smiled when Eliza opted to wear the hat all. day. long. Deb made the coat and skirt. Lucky us to mooch off her super sewing skills. Both Eliza and I loved the details of the costume. The buckled shoes, the red lining in the coat, the silver buttons, the bird umbrella. Ali went as Glinda, the Good Witch. When the Tin Man knocked on our door with his three-year old Dorothy, they swooned over Glinda’s dress. Ali helped Dorothy chose her candy and when Dorothy left she called out, “Goodbye Glinda! I love you!” Made Ali’s night. Sami, who loves all things kitty, didn’t surprise us when she wanted to be a black cat. Had it not been for Eliza though, I would have sent her off to school without whiskers! Typical non-firing of all cylinders. Sir Spencer of the Rectangle Table wielded his black sword skillfully – whacking at dragons, bad guys, and Gordon. Stand back if you’re within arm’s length. Silly guy. He always has a twinkle in his eye. I’m holding tight to these boys. Every day I feel the pace of their growing up and I can hardly stand it. Gordon also mastered the skill of sword swinging. And with great clashing sound effects. Sir Gordon. Mighty defender of Glinda, Mary, and black cats everywhere. Then…. they were off! With Ali turning back to retrieve her dropped bag. Costumes and candy are great fun, but really, it’s our neighbors that make Halloween so special. So I captured a handful of faces for you. I wish the fading light would have allowed me more. This is Erica, who lives up the street, and happens to be my second cousin. Our grandmothers are sisters. Love her. My boys have become extensions of her trampoline. Some days they live at her house more hours than they do at mine. Susie and Robert always grill hot dogs. A ton of work for them, while simplifying Halloween for the rest of us. Bless them. It’s so nice not to worry about dinner. We just make the Gardiner’s garage one of our first stops. Eliza couldn’t wait to see Miss Tiffany, her primary teacher from church. Tiffany also happens to be my visiting teacher. (Every woman in the LDS church is assigned a friend to look after, care for, serve, and strengthen. This friend is called a Visiting Teacher.) Tiffany has been so good to our family. She’s helped me with the boys, brought meals when needed, books, puzzles, and friendship. We love her. And here’s Margit in her pigtails. Heart of gold, friend to all. Wish I had pictures of all the good people in our neighborhood. They are why I never want to leave this beautiful place. Last stop for most of our crew was Marion’s house. With her famous bubble-wrapped stairs. The snap and pop with every step is a total kick for kids (and parents). Marion’s house bumps up to our backyard so the kids watched them set up all afternoon. Her husband, Steve, is currently serving as the Bishop (pastor) of our congregation. Always positive, always compassionate. They would do anything for anyone. Somewhere along the route Glinda grew fangs. Nice touch, eh? After scones and hot cider up the street, the kids oozed onto the floor with their piles of candy. Which they ate, sorted, and handed over for safe-keeping. Morning came early. All the kids were fed, dressed, and in the car by 7:30 AM for dentist appointments. What was I thinking?? Brutal! And the tired tears by Friday evening? Man! But hey! Now they have clean teeth for all those starbursts and chocolate to rot. Perfect. Oh my goodness, Mary Poppins. Brilliant! All of their costumes are cute! So wonderfully cute and fun! After seeing these shots of Gordon and Spencer, PLEASE tell me you have David Mellings' series "Good Knight, Sleep Tight"? I'm sure they would love the antic of the dear knight and his horse! Ummm… no! So glad you told me! That will be one of their books for Christmas. Love you Kel. Those are fantastic pictures Cath! Love those little faces. I'm so glad you all had a great Halloween. I need to figure out how to slow down the day so it lasts longer! 🙂 Love you!